Okay, here is a fact- 80% of the 254 retail professionals that participated in a survey said that email marketing is the most profitable marketing channel followed by organic search and social media. So, I guess we all have a picture of how important email marketing is in the e-commerce industry. 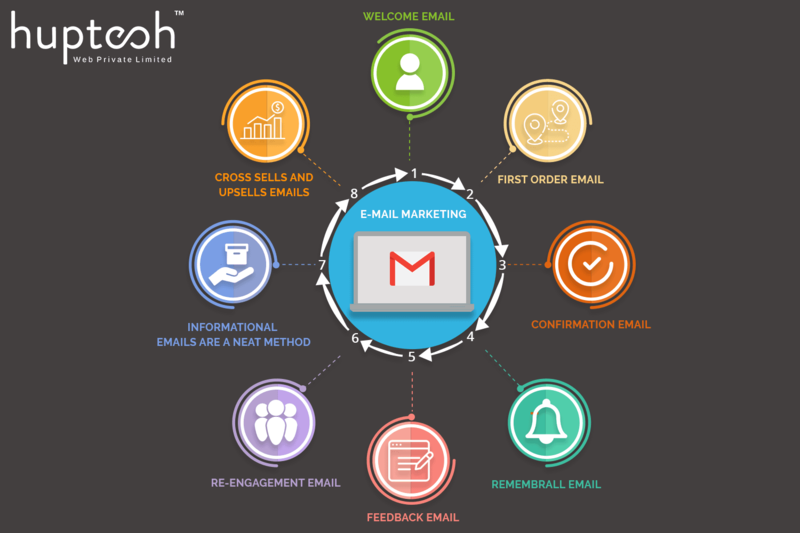 But to achieve that rate of success which forces you to think that investment in email marketing is bliss, you need to have a complete understanding of when, how, and what to email to convert as well as retain your customers. Well, it’s simple, all you have to do is consider your customer’s journey with you as their lifecycle. This lifecycle is divided into three main stages- New Customers, Existing, and Dwindled. There are a lot of things to consider before you make your mailing list but today, we are going to talk about at what point do you need to send marketing e-mails to the customers. In all, the types of emails you may need to create for different stages of the customer’s lifecycle! The first e-mail to a freshly signed customer is your chance to make a grand impression for your brand. Although the sign-up is itself a sign of interest in the brand, this welcome mail will display your correspondence capacity to the customers. The tone should be perfectly warm with a tinge of personal touch and as simple as possible. Make sure you don’t gag the customers with overly personalized welcome notes! All you have to remember for this campaign is that there will be many more instances where you will have the chance of more conversions, so make the welcome email minimalistic and at the same time visually attractive. Avoid conveying more than necessary with additional information. As I said, you will have plenty of opportunities for that! Including a ‘virtual mobile screen’ with Google maps showing your physical store location could be a good idea. Receiving the first order from a customer is a huge thing, it is a confirmation of the probability that you just bagged a lifetime customer. But we all know how tough the competition is; if only the customers would be so loyal to stick to their e-commerce partner! Well, Amazon has made it, maybe you can too! Sans the hard work, it is not possible but how will you know without trying? So let your first-time buyers know how excited you are to be at their service. Congratulate them on their first order and tell them you’ll be glad to be at their service anytime soon. This is one of the most common mistakes committed by small to medium scaled businesses. Well, they do send confirmation email but without the details that it must have. Customers are looking for e-commerce platforms who not only offer good products but have commendable logistics. Anything below the smart range is simply frowned upon. So your confirmation mails should not miss the order details such as order ID, Tracking ID, and estimated delivery time. There is a plethora of shoppers and even more reasons why they abandon their cart. The amount went way beyond the budget and now felt too lazy to choose what to buy, no intention to shop, high-delivery rate, found a better deal, genuine hurry, caught up in some work and intend to order later, etc. are just some of the common reasons. Whatever the reason be, you have to assume that your customers wanted to buy that passionately and just couldn’t at that moment. So what’ll you do? Yes, remind them they chose some lovely items and forgot to order. All you have to do is be thoughtful, not pushy! Here you have to be extremely cautious as these emails have the tendency of annoying the consumers. But the naked truth is that you need feedbacks. Reviews have the capacity to drive your sales both the ways. So, how will you do it? Well, imagine how you would like to be asked for a feedback? Yes, we don’t want the form to be very long. So concision is what works for feedback emails. There will always come a time in each of your customer’s lifecycle when they will go into hibernation and you will not hear from them for quite a long time. Yes, exactly, it’s time for ‘Long time, no see!’ kind of emails! There could be many reasons for this lapse and it is your responsibility to check on your customers. Why you ask?? Because it is much cheaper to retain a customer than to engage a new one. So you’ll fail terribly if you let your older customers go thinking that you will always build a clientele. Make your re-engagement emails all about your need to get them back. Offer your soul if you have to! Remember, you are a seller! You can add the details of either the coming up deals or make the customer regret by adding what kind of deals they missed when they weren’t around and here is their chance! Buy this, buy this!- This is not art and this is absolutely not how you sell! To make this entire thing subtle, there are information emails. Now, this is a fact that no customer is going to buy from your every day, right? But you still have to maintain that rapport with them. These emails are to be sent between their purchases and the next purchase. You can share your brand’s story blog, or convey them how you rewarded the top reviewers, etc. All it needs is relevance! If you win the game of customer satisfaction, you also have to win the money game, after all, you are running a business and earning profits is the goal. Cross-sell and upsell emails will let you achieve that goal as you will strategize the pitching of products that go with an already-purchased product (cross-sell/ instance: pitching headphones if the purchase was a phone) or the products that have a significantly higher value than the last purchase (Upsell). Cross-sell will increase the number of orders and ultimately your profits. Upsell emails are a hard seller but a strong one as the margin of profit is bigger for these products. Above all of these, never make the mistake of spamming your customers or compromise their data. The ones who are lost because of these reasons will definitely never come back but will also not allow their friends, your potential customers to buy from your e-commerce store!